The taper for next weekend’s Garmin Marathon is in full effect!! Monday- no run. no miles. nothing. I was zapped for energy after last weekends double-run…and the traveling!! Yeah, I had a lot of different times that I could have run…but I just didn’t. And, at the end of the day, I enjoyed cuddling in bed with my little man more than getting changed for 1 mile… It was bound to happen – I just didn’t see it happening this early in the year. Restart!! 100 days with 1 missed day, that still sounds pretty great! Tuesday- We can start each day with the best of intentions, but it doesn’t always work out! I wanted a morning run, didn’t happen. I wanted a lunch run, wasn’t a great time with the prairie burning and smoke around too thick to see the sun. So, I planned on going for a short run at the ball fields – but little man wouldn’t leave my side, so we went for a walk to the playground. Whatever the excuse, I was eventually able to get in my mile! Thursday- Today was one of those days that I didn’t want to waste. It was going to warm up quite a bit and with the possibility of more controlled prairie burning today, I wanted to get out while I could breathe! I started out a little later than I wanted, ran past my running buddies house to see if she was going to pop out (sadly, she did not,…but totally fine! ), and then headed out for a few miles. I aimed to keep my HR below 140 while keeping my stride short and quick ~ metronome set to 180 bpm. I was successful with keeping my HR around 140 (only 0:13 in Zone 4) but my metronome set at 180 bpm allowed me to keep an average of 165-177 bpm. My walking and “waiting for cars” times brought my average down to a 164 average, but I am okay with that! Friday- A warm afternoon run! I decided to text one of the group “leaders” that I was going to head home, better safe than sorry! But on my way back, as I was crossing a street, a familiar face stopped to give me a ride 🙂 My buddy Angie was driving to the meet up for the group run…so I hopped in and off we went! Morning run cut short due to lightening…boo. • Run SOME OF the miles…still drinking all of the coffee!! • BABY TIME!! Sunday- Due to the short run on Saturday, I received an e-mail later Saturday about some of the runners heading out for a few more miles Sunday morning. I’m game! Since we got stormed out yesterday morning, some runners got in a few more miles this morning! • The humidity is in full effect today…I am okay with starting in the 60s, but he humidity can go away!! • Happy Easter!! Next week caps off my training with the Garmin Marathon in KC on Saturday! After that…on to more pacing and running Hospital Hill!! Sorry the run streak was broken but still a great week. Love your reflective vest thing! You should be proud of streaking for 100 days! You could take a couple of days rest before beginning again. Boo to the humidity. My HR is always higher in the summer. I can’t imagine running with the fields burning. Thanks for linking, Lindsey! I am not looking forward to the heat and humidity AT ALL. 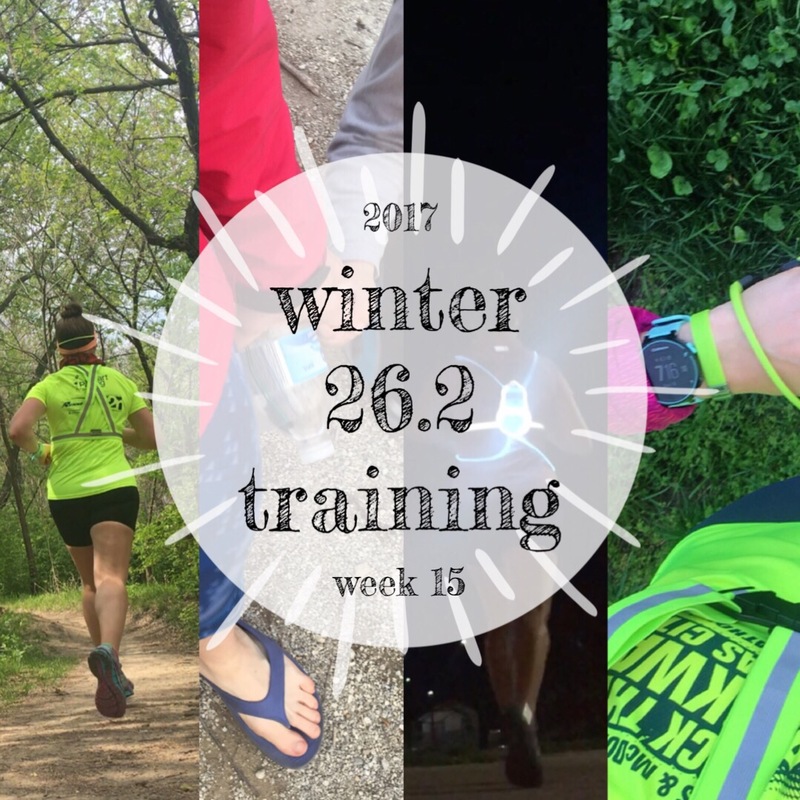 Best of luck at the Garmin marathon…great post!! Hope that you had a great race at the marathon – I’ve seen a couple of posts from folks who ran it! Can’t wait to hear about it!